Meet Rylai, a truly adorable domesticated fox made possible through years of selective breeding experiments in Russia. Born in early April, 2015, this precious fox cub has already garnered over 63,000 followers on Instagram. 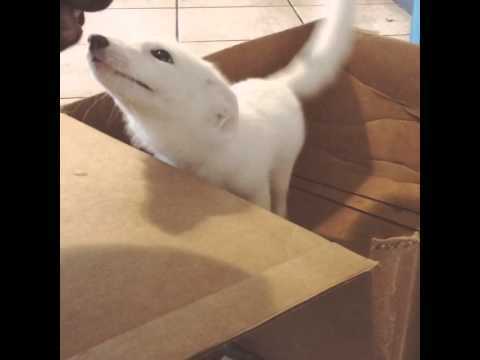 Rylai’s owner acquired her from a licensed fox dealer, and named her after a character in the massively popular, free-to-play online video game DoTA2. Eventually, though, she made a name all for herself. Although Rylai was technically a red fox, her fur never actually turned red. Instead, her coloring was a variation called “white marble,” which does not occur naturally in the wild. Not only that, but her owner said she was the perfect companion right from the start. While she was never the typical pet, that didn’t stop Rylai’s owner from making the fox part of the family. As part of a line of foxes who are supposedly domesticated, she’s supposed to behave in much the same way as a dog. Would that prove to be the case, though? Rylai’s owners were careful about maintaining a healthy diet for her, and the little fox loved to eat an organic puree of chicken and turkey. That went along with plenty of fruits and vegetables, as well! Domesticated foxes like Rylai can live up to 15 years, which is actually quite a long time… that’s longer than the vast majority of dogs are able to live! So, her owners knew they had years with this fur ball to look forward to, at the very least. Nonetheless, that didn’t mean that they didn’t have to be careful with her. Much like a dog, she received rabies and heart-worm prevention shots. She even got to see a veterinarian who specialized in exotic animals! As a pup, Rylai loved to go outside for long walks in her harness, much like any dog would. Still, she grew up inside and, according to her owner, tended to be a little bit nervous in the outdoors. Rylai also loved to take naps as frequently as possible, and it was absolutely precious to watch. Not only that, but it’s important to remember that sleeping well is vital for any young animal. She took a lot of naps, actually. It’s hard to blame her for that, though. It must have been exhausting to spend all day and night being the cutest thing anyone had ever seen! All seemed to be going well for this domesticated fox and her owner, but they did face some obstacles. “Foxes are mischievous and will do whatever they want, regardless of how they think you feel about it,” her owner explained. That means that, as she grew, Rylai became quite the handful. Turns out, foxes aren’t always the cuddliest of critters. According to her owner, Rylai would cuddle with her humans, but not like a dog or a cat would. It’s important to remember that, while she was domesticated, she hasn’t had thousands of years of domestication like those animals do. While Rylai did things her own way, she also had to learn how to interact with more common pets. Case in point, Rylai had a pair of more traditional siblings who she got along with swimmingly. Kratos the dog and Jar Jar the cat made for the perfect partners in crime! Though little Rylai eventually grew up, she never seemed to stop being a good pet. She was still just as lovable—and loving—as she ever was! Obviously, not everyone was thrilled with the idea of domesticating wild animals, but it seemed to work out for Rylai and her family!